I have always loved to wear sneakers ever since I was kid, in fact I have one pair in my wardrobe that are over 10 years old. They are quite literally falling apart at the seams but they are just so goddamn comfortable and I love them too much to get rid of them. So it is quite likely that if I ever do get married, I will be one of those brides that sports her sneakers at the end of the night and there is a good chance that it will the very pair that we are going to show you to DIY today. 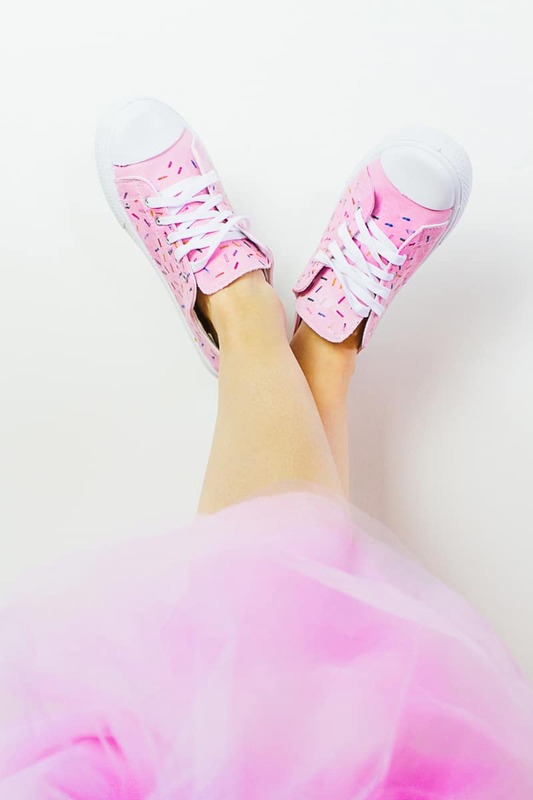 We decided that sneakers needed sweetening up and so we created a DIY that would make your shoes so tasty that you will just want to eat them up! Download the sprinkle PDF and print on to your iron on paper. Cut your PDF into manageable sections. I found it helped to cut smaller squares, taking care to cut around the sprinkles as you don’t want them to be cut in half when you Iron them on. Place your iron on paper face down on to the surface of the shoe and iron on, pushing down firmly. This is can be a little tricky as the surface will bend as you push down and will also become very hot, so this is where the tea towel comes in handy, pack the shoes with it so that the canvas can’t moved around too much and you won’t get your hands burnt in the process. NOTE: Take care to not touch the rubber with the iron too as it will melt! Continue to do this until the entire surface of your sneaker is covered in cute sprinkles. It helps to take the laces out too, then you can re-thread them after. I am so happy with they way these turned out. I think they might be the cutest shoes I have ever owned!